Home » Personal Finance » EPF UAN Correction – How to update Name, Birth Date Online in UAN? You can correct/update your name, date of birth (dob) and gender online on the UAN portal. This process is known as EPF UAN Correction. 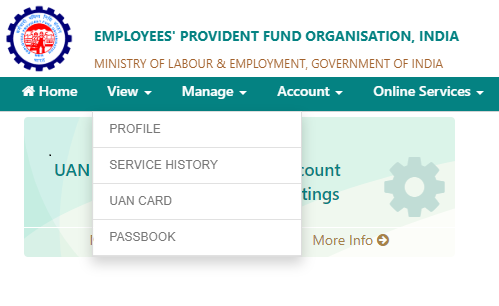 If you try to link your Aadhaar with your UAN and unable to do that because of mismatch in name, date of birth or gender in UAN data, you can use UAN portal to update these details. Let’s look at process of correcting name, birthdate or gender on UAN portal as per Aadhaar. This process will work only if your Aadhaar is not linked with UAN. If you are Aadhaar is linked with UAN you cannot update/correct these details online. 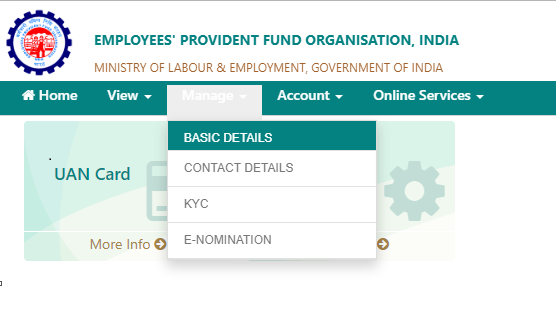 To correct EPF UAN data employee need to raise online request by logging into UAN Portal. The submitted request will be forwarded to Employer. Employer can approve or reject the request online. If the employer approves the request it will be sent to EPFO office where officer will approve or reject the request. The timeline for approving or rejecting request submitted online is not known. If your Aadhaar is linked with UAN you cannot use online method for correction. In this case, you need to use offline method of filing manual form to EPFO. How to update Name, Birth Date & Gender Online in UAN? Step by step method of correcting name, birth date & gender online in UAN is given below. The process given below needs to be done by Employee. First step is Login to Member Interface of Unified Member Portal using your UAN and Password. You can get UAN number from your employer. If your UAN is not activated you need to activate your UAN first. On login you will be able to see navigation bar. Click on Manage> Basic Details. You need to provide correct details as per Aadhaar UIDAI. This data will be compared with UIDAI database. On clicking Update Details, the request will be submitted to the employer for further approval. Alternative way to update basic detail is by visiting profile. You can visit Profile by View> PROFILE. You will be able to see following screen which will allow you to change name, date of birth, gender, mobile number, email address, qualification and marital status. If you give request for name, birth date or gender change, this request needs to be approved by employer. Once you submit the change request it will be automatically sent to employer for approval. The progress will be visible in the same section. If you want to change email address, mobile number, marital status or qualification you can easily change that. This change does not require approval from employer. However, it requires OTP based authentication. Once you click on request to change marital status, qualification or salutation, you will be asked required inputs. It will be drop down selection based. Once you change this detail you need to click on Get Authorization Pin. On clicking Get Authorization Pin you will see confirmation popup box asking about confirming change. On clicking Yes button, you will receive OTP on registered mobile number. You need to enter OTP and press save changes. Changes will be saved successfully. Once you submit the request online your employer will have to approve or reject the request online. Once request will be approved it will be forwarded to EPFO office for final approval. The step followed by employer are given below. The employer will log in to Employer Interface of Unified Portal. The employer can approve or reject the request. If the employer approves the request will be transferred to EPFO field office. In the EPFO office, the Dealing Hand will submit his recommendations, Recommended for Approval or Recommended for Rejection with proper remarks, online in the Field Office Interface of Unified Portal. This request will then be verified by Section Supervisor. Finally, Assistant Provident Fund Commissioner(APFC)/Regional Provident Fund Commissioner (RPFC) can Approve/Reject the case. Note – Above process is applicable only if UAN is not linked to Aadhaar. If UAN is already linked to Aaddhar you cannot change basic detail such as Name, Birth Date, Gender etc. In case you are required to change this detail you need to submit a joint request to the concerned EPFO field office for correction of above mentioned basic details.